346/365 – “Meet Shadow” nr.12, a photo by Luca Rossini on Flickr. Twelfth day of “Meet Shadow”. My two little girls. 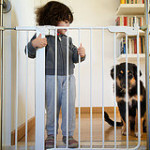 Both waiting at the baby gate, closed to prevent Agata from walking down the stairs unsupervised. 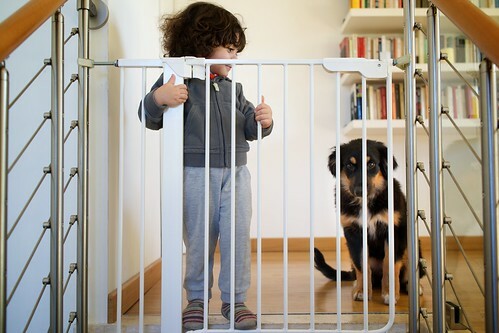 Look at how Agata behaves as the “older sister” with Ombra, smiling at the puppy’s anxiety for the closed gate. Agata used to get very anxious when Claudia or I would walk upstairs exactly as anxious as Ombra gets now. But now that there’s a puppy, that is a younger family member, she behaves as an experienced girl who knows better. It’s not only too cute, it’s also very convenient!